Kievan Rus' (Old East Slavic Рѹ́сь, Рѹ́сьскаѧ землѧ, Greek Ῥωσία, Latin Russia, Ruthenia, Ruscia, Ruzzia, Old Norse Garðaríki) was a loose federation of East Slavic tribes in Europe from the late 9th to the mid-13th century, under the reign of the Rurik dynasty. The modern peoples of Belarus, Ukraine, and Russia all claim Kievan Rus' as their cultural inheritance. At its greatest extent in the mid-11th century, it stretched from the Baltic Sea in the north to the Black Sea in the south and from the headwaters of the Vistula in the west to the Taman Peninsula in the east, uniting the majority of East Slavic tribes. Kievan Rus' begins with the rule (882–912) of Prince Oleg, who extended his control from Novgorod south along the Dnieper river valley in order to protect trade from Khazar incursions from the east and moved his capital to the more strategic Kiev. Svyatoslav (died 972) achieved the first major expansion of Kievan Rus' territorial control. Vladimir the Great (980–1015) introduced Christianity with his own baptism and, by decree, that of all the inhabitants of Kiev and beyond. Kievan Rus' reached its greatest extent under Yaroslav I (1019–1054); his sons assembled and issued its first written legal code, the Rus' Justice, shortly after his death. The state declined beginning in the late 11th century and during the 12th century, disintegrating into various rival regional powers. It was further weakened by economic factors such as the collapse of Rus' commercial ties to Byzantium due to the decline of Constantinople and the accompanying diminution of trade routes through its territory. The state finally fell to the Mongol invasion of the 1240s. During its existence, Kievan Rus' was known as the "land of the Rus'" (Old East Slavic: Рѹ́сьскаѧ землѧ, from the ethnonym Рѹ́сь; Greek: Ῥώς; Arabic: الروس ar-Rūs), in Greek as Ῥωσία, in Old French as Russie, Rossie, in Latin as Russia (with local German spelling variants Ruscia and Ruzzia), and later also as pseudo-antique Ruthenia. Various linguistic theories regarding the derivation of the name have been set forth, including Ruotsi, the Finnish designation for Sweden, and Ros, a tribe from the middle Dnieper valley region. The term "Kievan Rus'" (Ки́евская Русь Kievskaya Rus’) was coined in the 19th century in Russian historiography to refer to the period when the center was in Kiev. In English, the term was introduced in the early 20th century, when it was found in the 1913 English translation of Vasily Klyuchevsky's A History of Russia, to distinguish the early polity from successor states, which were also named Rus. Later, the Russian term was rendered into Belarusian and Ukrainian as Кіеўская Русь Kijeŭskaja Rus’ and Ки́ївська Русь Kyivs'ka Rus’, respectively. Prior to the emergence of Kievan Rus', the lands between the Baltic Sea and Black Sea had been primarily populated by eastern Slavic tribes. In the northern region around Novgorod were the Ilmen Slavs and neighboring Krivichi, who occupied territories surrounding the headwaters of the West Dvina, Dnieper, and Volga Rivers. To their north, in the Ladoga and Karelia regions, were the Finnic Chud tribe. In the south, in the area around Kiev, were the Poliane, a group of Slavicized tribes with Iranian origins, the Drevliane to the west of the Dnieper, and the Severiane to the east. To their north and east were the Vyatichi, and to their south was forested land settled by Slav farmers, giving way to steppelands populated by nomadic herdsmen. Controversy persists over whether the Rus’ were Varangians (Vikings) or Slavs, largely due to a paucity of contemporary sources. The origin of the Rus' must instead rely on archaeological evidence, the notations of foreign observers, and legends and literature recorded centuries later. To some extent the controversy is related to the "foundation myths" of the modern states in the region. According to the "Normanist" view, Scandinavians brought civilisation to the Slavs, while Russian nationalist historians argue that the Rus' were themselves Slavs. Proponents of the Norman theory embrace the earliest written source for the East Slavs, the Russian Primary Chronicle, an account produced much later, in the 12th century. Critics have pointed out that no group called the Rus' have been located in Scandinavia itself and were unknown in the west, while other accounts, themselves questionable, have suggested the existence of the Rus' before the arrival of the Varangians. Further, only a handful of Scandinavian words may be found in modern Russian language, and Scandinavian names in the early chronicles were soon replaced by Slavic names. Nevertheless, archaeological evidence from the area suggests that a Scandinavian population was present during the 10th century at the latest. The reality is probably that the Rus’ elite were Scandinavian, but the great majority of the people were Slav. They said to themselves, "Let us seek a prince who may rule over us, and judge us according to the Law." They accordingly went overseas to the Varangian Rus' … The Chuds, the Slavs, the Krivichs and the Ves then said to the Rus', "Our land is great and rich, but there is no order in it. Come to rule and reign over us". They thus selected three brothers with their kinfolk, who took with them all the Rus' and migrated. The Chronicle reports that Askold and Dir continued to Constantinople with a navy to attack the city in 863-66, catching the Byzantines by surprise and ravaging the surrounding area, though other accounts date the attack in 860. Patriarch Photius vividly describes the "universal" devastation of the suburbs and nearby islands, and another account further details the destruction and slaughter of the invasion. The Rus' turned back before attacking the city itself, due either to a storm dispersing their boats, the return of the Emperor, or in a later account, due to a miracle after a ceremonial appeal by the Patriarch and the Emperor to the Virgin. The attack was the first encounter between the Rus' and Byzantines and led the Patriarch to send missionaries north to engage and attempt to convert the Rus' and the Slavs. East-Slavic tribes and peoples, 8th-9th century. Rurik led the Rus' until his death in about 879, bequeathing his kingdom to his kinsman, Prince Oleg, as regent for his young son, Igor. In 880-82, Oleg led a military force south along the Dnieper river, capturing Smolensk and Lyubech before reaching Kiev, where he deposed and killed Askold and Dir, proclaimed himself prince, and declared Kiev the "mother of Rus' cities." Oleg set about consolidating his power over the surrounding region and the riverways north to Novgorod, imposing tribute on the East Slav tribes. In 883, he conquered the Drevliane, imposing a fur tribute on them. By 885 he had subjugated the Poliane, Severiane, Vyatichi, and Radimichs, forbidding them to pay further tribute to the Khazars. Oleg continued to develop and expand a network of Rus' forts in Slav lands, begun by Rurik in the north. The rapid expansion of the Rus' to the south led to conflict and volatile relationships with the Khazars and other neighbors on the Pontic steppe. The Khazars dominated the Black Sea steppe during the 8th century, trading and frequently allying with the Byzantine Empire against Persians and Arabs. In the late 8th century, the collapse of the Göktürk Khaganate led the Magyars and the Pechenegs, Turkic peoples from Central Asia, to migrate west into the steppe region, leading to military conflict, disruption of trade, and instability within the Khazar Khaganate. The Rus' and Slavs had earlier allied with the Khazars against Arab raids on the Caucasus, but they increasingly worked against them to secure control of the trade routes. 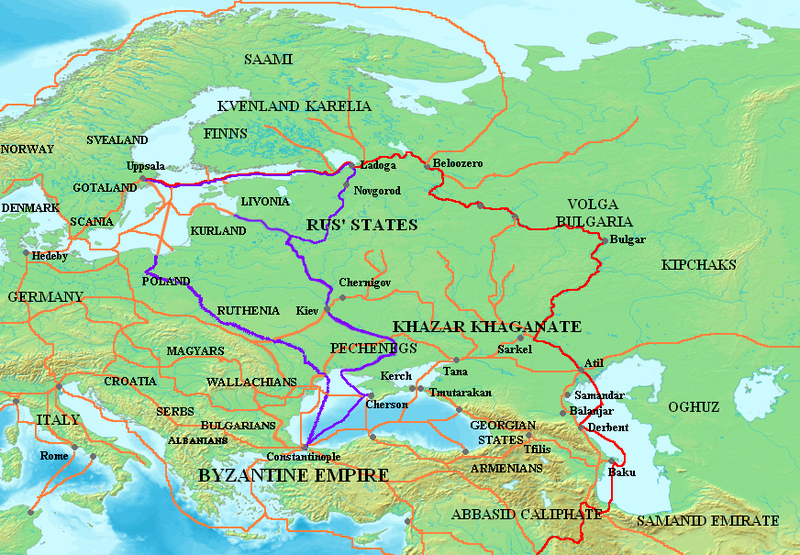 The Volga trade route (red), the "route from the Varangians to the Greeks" (purple), and other trade routes of the 8th-11th centuries (orange). The Byzantine Empire was able to take advantage of the turmoil to expand its political influence and commercial relationships, first with the Khazars and later with the Rus' and other steppe groups. 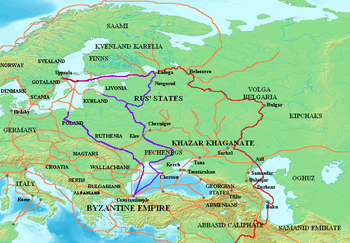 The Byzantines established the Theme of Cherson, formally known as Klimata, in the Crimea in the 830s to defend against raids by the Rus' and to protect vital grain shipments supplying Constantinople. Cherson also served as a key diplomatic link with the Khazars and others on the steppe, and it became the center of Black Sea commerce. The Byzantines also helped the Khazars build a fortress at Sarkel on the Don river to protect their northwest frontier against incursions by the Turkic migrants and the Rus’, and to control caravan trade routes and the portage between the Don and Volga rivers. The expansion of the Rus’ put further military and economic pressure on the Khazars, depriving them of territory, tributaries, and trade. In around 890, Oleg waged an indecisive war in the lands of the lower Dniester and Dnieper rivers with the Tivertsi and the Ulichs, who were likely acting as vassals of the Magyars, blocking Rus' access to the Black Sea. In 894, the Magyars and Pechenegs were drawn into the wars between the Byzantines and the Bulgarian Empire. The Byzantines arranged for the Magyars to attack Bulgarian territory from the north, and Bulgaria in turn persuaded the Pechenegs to attack the Magyars from their rear. Boxed in, the Magyars were forced to migrate further west across the Carpathian mountains into the Hungarian plain, depriving the Khazars of an important ally and a buffer from the Rus'. The migration of the Magyars allowed Rus' access to the Black Sea, and they soon launched excursions into Khazar territory along the sea coast, up the Don river, and into the lower Volga region. The Rus' were raiding and plundering into the Caspian Sea region by 913, when they raided Baku and penetrated into the Caucasus. As the 10th century progressed, the Khazars were no longer able to command tribute from the Volga Bulgars, and their relationship with the Byzantines deteriorated, as Byzantium increasingly allied with the Pechenegs against them. The Pechenegs were thus secure to raid the lands of the Khazars from their base between the Volga and Don rivers, allowing them to expand to the west. Rus’ relations with the Pechenegs were complex, as the groups alternately formed alliances with and against one another. The Pechenegs were nomads roaming the steppe raising livestock which they traded with the Rus’ for agricultural goods and other products. The lucrative Rus’ trade with the Byzantine Empire had to pass through Pecheneg-controlled territory, so the need for generally peaceful relations was essential. Nevertheless, while the Primary Chronicle reports the Pechenegs entering Rus' territory in 915 and then making peace, they were waging war with one another again in 920. Pechenegs are reported assisting the Rus’ in later campaigns against the Byzantines, yet allied with the Byzantines against the Rus’ at other times. After the Rus' attack on Constantinople in 860, the Byzantine Patriarch Photius sent missionaries north to convert the Rus' and the Slavs. Prince Rastislav of Great Moravia had requested the Emperor to provide teachers to interpret the holy scriptures, so in 863 the brothers Cyril and Methodius were sent as missionaries, due to their knowledge of the Slavonic language. The Slavs had no written language, so the brothers devised the Glagolitic alphabet, later developed into Cyrillic, and standardized the language of the Slavs, later known as Old Church Slavonic. They translated portions of the Bible and drafted the first Slavic civil code and other documents, and the language and texts spread throughout Slavic territories, including Kievan Rus’. The mission of Cyril and Methodius served both evangelical and diplomatic purposes, spreading Byzantine cultural influence in support of imperial foreign policy. 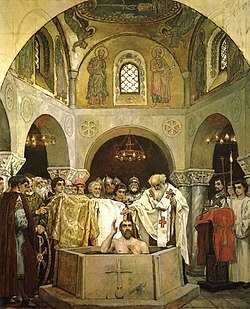 In 867 the Patriarch announced that the Rus' had accepted a bishop, and in 874 he speaks of an "Archbishop of the Rus'." Relations between the Rus’ and Byzantines became more complex after Oleg took control over Kiev, reflecting commercial, cultural, and military concerns. The wealth and income of the Rus' depended heavily upon trade with Byzantium. Constantine Porphyrogenitus described the annual course of the princes of Kiev, collecting tribute from client tribes, assembling the product into a flotilla of hundreds of boats, conducting them down the Dnieper to the Black Sea, and sailing to the estuary of the Dniester, the Danube delta, and on to Constantinople. On their return trip they would carry silk fabrics, spices, wine, and fruit. The importance of this trade relationship led to military action when disputes arose. The Primary Chronicle reports that the Rus' attacked Constantinople again in 907, probably to secure trade access. The Chronicle glorifies the military prowess and shrewdness of Oleg, an account imbued with legendary detail. Byzantine sources do not mention the attack, but a pair of treaties in 907 and 911 set forth a trade agreement with the Rus', the terms suggesting pressure on the Byzantines, who granted the Rus' quarters and supplies for their merchants and tax-free trading privileges in Constantinople. Following the death of Grand Prince Igor in 945, his wife Olga ruled as regent in Kiev until their son Svyatoslav reached maturity (ca. 963). His decade-long reign over Rus' was marked by rapid expansion through the conquest of the Khazars of the Pontic steppe and the invasion of the Balkans. By the end of his short life, Svyatoslav carved out for himself the largest state in Europe, eventually moving his capital from Kiev to Pereyaslavets on the Danube in 969. In contrast with his mother's conversion to Christianity, Svyatoslav, like his druzhina, remained a staunch pagan. Due to his abrupt death in an ambush in 972, Svyatoslav's conquests, for the most part, were not consolidated into a functioning empire, while his failure to establish a stable succession led to a fratricidal feud among his sons, resulted in two of his three sons being killed. It is not clearly documented when the title of the Grand Duke was first introduced, but the importance of the Kiev principality was recognized after the death of Svyatoslav in 972 and the ensuing struggle between Vladimir the Great and Yaropolk I. The region of Kiev dominated the state of Kievan Rus' for the next two centuries. The Grand Prince (velikiy kniaz') of Kiev controlled the lands around the city, and his formally subordinate relatives ruled the other cities and paid him tribute. The zenith of the state's power came during the reigns of Vladimir the Great (980–1015) and Prince Yaroslav I the Wise (1019–1054). Both rulers continued the steady expansion of Kievan Rus' that had begun under Oleg. Vladimir had been prince of Novgorod when his father Svyatoslav died in 972. He was forced to flee to Scandinavia in 976 after his half-brother Yaropolk had murdered his other brother Oleg and taken control of Rus. In Scandinavia, with the help of his relative Earl Håkon Sigurdsson, ruler of Norway, Vladimir assembled a viking army and reconquered Novgorod and Kiev from Yaropolk. As Prince of Kiev, Vladimir's most notable achievement was the Christianization of Kievan Rus', a process that began in 988. The Primary Chronicle states that when Vladimir had decided to accept a new faith instead of the traditional idol-worship (paganism) of the Slavs, he sent out some of his most valued advisors and warriors as emissaries to different parts of Europe. They visited the Christians of the Latin Rite, the Jews, and the Muslims before finally arriving in Constantinople. They rejected Islam because, among other things, it prohibited the consumption of alcohol, and Judaism because the god of the Jews had permitted his chosen people to be deprived of their country. They found the ceremonies in the Roman church to be dull. But at Constantinople, they were so astounded by the beauty of the cathedral of Hagia Sophia and the liturgical service held there that they made up their minds there and then about the faith they would like to follow. Upon their arrival home, they convinced Vladimir that the faith of the Byzantine Rite was the best choice of all, upon which Vladimir made a journey to Constantinople and arranged to marry Princess Anna, the sister of Byzantine emperor Basil II. Vladimir's choice of Eastern Christianity may also have reflected his close personal ties with Constantinople, which dominated the Black Sea and hence trade on Kiev's most vital commercial route, the Dnieper River. Adherence to the Eastern Church had long-range political, cultural, and religious consequences. The church had a liturgy written in Cyrillic and a corpus of translations from Greek that had been produced for the Slavic peoples. This literature facilitated the conversion to Christianity of the Eastern Slavs and introduced them to rudimentary Greek philosophy, science, and historiography without the necessity of learning Greek (there were some merchants who did business with Greeks and likely had an understanding of contemporary business Greek). In contrast, educated people in medieval Western and Central Europe learned Latin. Enjoying independence from the Roman authority and free from tenets of Latin learning, the East Slavs developed their own literature and fine arts, quite distinct from those of other Eastern Orthodox countries. (See Old East Slavic language and Architecture of Kievan Rus for details ). Following the Great Schism of 1054, the Rus' church maintained communion with both Rome and Constantinople for some time, but along with most of the Eastern churches it eventually split to follow the Eastern Orthodox. That being said, unlike other parts of the Greek world, Kievan Rus' did not have a strong hostility to the Western world. In addition to collecting tribute, Vladimir's sons were responsible for defending the orthodox missions and protecting their borders. These functions, as well as military engagements for conquest, required each prince to have a military force at his disposal. Like their forefathers, Vladimir and his sons each relied on a Druzhina, a military force they supported and maintained in permanent service. By dispersing his sons around the country Vladimir also ensured that their military forces would be stationed at some distance from one another, where they could defend the frontiers of Kievan Rus' and also be less likely to fight each other. Yet, in a pressing situation, any one of the princes could supplement his military force with auxiliary troops, drafted among the slav population or hired from abroad. Although Varangians were originally foot soldiers, the armed forces of Kieven Rus' princes increasingly became horsemen. Their armor included helmets, cuirasses, and shields; their weapons consisted of swords, spears, maces, and battle-axes. Bows and arrows were also used, usually by auxiliary troops. Commercial opportunities had been one of the most compelling features that had initially attracted the Varangians to the Slavic lands. Vladimir and his sons sold local products as well as prisoners taken in battle for silver and commodities that were more useful or valuable to them for military purposes as status symbols, or, after 988, for conducting religious services and ceremonies. In 965 prince Svyatoslav conducted an attack on Sarkel, a Khazar fortress that stood on the Don River guarding the approaches to the Khazar Empire from the Black Sea, and on Khazar territories in the North Caucasus. His victory is considered to have delivered a fatal blow to Khazaria, which subsequently collapsed. Its demise, recorded in both the Primary Chronicle and Islamic sources, shocked and destabilized the entire region of the lower Volga, Caspian, and North Caucasus. Outline map of Kievan Rus about 1054 superimposed on 21st-century borders. Yaroslav, known as "the Wise", struggled for power with his brothers. A son of Vladimir the Great, he was vice-regent of Novgorod at the time of his father's death in 1015. Subsequently, his eldest surviving brother, Svyatopolk the Accursed, killed three of his other brothers and seized power in Kiev. Yaroslav, with the active support of the Novgorodians and the help of Viking mercenaries, defeated Svyatopolk and became the grand prince of Kiev in 1019. Although he first established his rule over Kiev in 1019, he did not have uncontested rule of all of Kievan Rus' until 1036. Like Vladimir, Yaroslav was eager to improve relations with the rest of Europe, especially the Byzantine Empire. Yaroslav's granddaughter, Eupraxia the daughter of his son Vsevolod I, Prince of Kiev, was married to Henry III, Holy Roman Emperor. Yaroslav also arranged marriages for his sister and three daughters to the kings of Poland, France, Hungary and Norway. Yaroslav promulgated the first East Slavic law code, Russkaya Pravda; built Saint Sophia Cathedral in Kiev and Saint Sophia Cathedral in Novgorod; patronized local clergy and monasticism; and is said to have founded a school system. Yaroslav's sons developed the great Kiev Pechersk Lavra (monastery), which functioned in Kievan Rus' as an ecclesiastical academy. Combined, the tribute commercial profits and fees assessed on specific segments of Rus' society provided the Ryurikid dynasty with the revenue necessary to support themselves and their military retainers or armies as well as the Church. In return the princes provided their subjects with protection and the priests offered spiritual guidance. Together they transformed an agglomeration of settlements surrounding forts, trade ports and sites for worship into a dynamic state dotted with economically thriving cities adorned with architectural mounuments which heightened the prestige of the members of the secular and ecclesiastical elites who sponsored their construction. The effects of the mingling of the Ryurikid dynasty, the Orthodox Church and the eastern slavs society were dramatic. By the reign of Prince Yaroslav the Wise the Wise, Kievan Rus' reached its golden age. This era was marked by an unsual degree of political unity and peace. The first version of the Ruskaya Pravda and the construction of the Church of St. Sophia with its school and library have been identified as its great achievements. The spirit of optimism was also found in the literature: The Sermon on Law and Grace composed between 1037 and 1051 by Hilarion, the first native of Kievan Rus to become Metropolitan of Kiev and All-Rus' is an example. The law code introduced by Yaroslav was repeatedly adapted to the changing social and economic conditions of the next two centuries and was adopted virtually throughout the realm. The expanded Ruskaya Pravda, as it emerged in the thirteenth century survived as the legal norm for the Russian principalities through the fourteenth and fifteenth centuries, long after the Kievan Rus' disappeared. Saint Sophia Cathedral in Novgorod, mid-11th century. Unconventional power succession system where the power was transferred not from father to son, but to the eldest member of the ruling dynasty, i.e. in most cases to the eldest brother of the ruler, bred constant hatred and rivalry within the royal family. Familicide was a rather common way to obtain power. That particularly could be traced during the time of Yaroslavichi rule (sons of Yaroslav) when the established rota system was skipped with establishing of Vladimir II Monomakh as the Grand Prince of Kiev in turn creating big squabbles between Olegovichi from Chernihiv, Monomakhs from Pereyaslav, Izyaslavichi from Turov/Volhynia, and Polotsk Princes. By 1130 all descendants of Vseslav the Seer were exiled to the Byzantine Empire by Mstislav the Great. The most fierce resistance to Monomakhs posed Olegovichi when the izgoi Vsevolod II managed to become the Grand Prince of Kiev. Rostislavichi who have initially established in Halych lands by 1189 were defeated by the Monomakh-Piast descendant Roman the Great. The decline of Constantinople — a main trading partner of Kievan Rus', played a significant role in the decline of the Kievan Rus'. The trade route from the Varangians to the Greeks, along which the goods were moving from the Black Sea (mainly Byzantine) through eastern Europe to the Baltic, was a cornerstone of Kiev wealth and prosperity. Kiev was the main power and initiator in this relationship, once the Byzantine Empire fell into turmoil and the supplies became erratic, profits dried out, and Kiev lost its appeal. 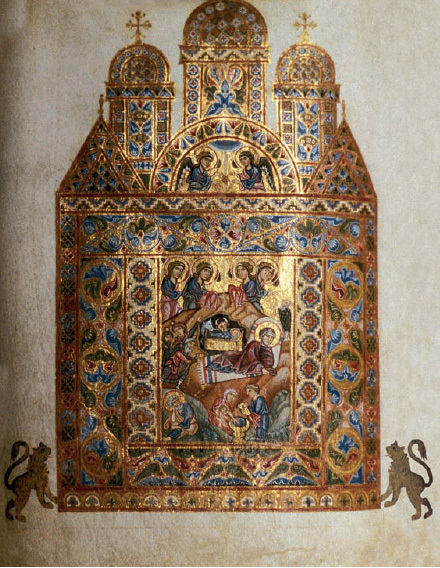 The Nativity, a Kievan (possibly Galician) illumination from the Gertrude Psalter. The most prominent struggle for power was the conflict that erupted after the death of Yaroslav the Wise. The rivaling Principality of Polotsk was contesting the power of the Grand Prince by occupying Novgorod, while Rostislav Vladimirovich was fighting for the Black Sea port of Tmutarakan belonging to Chernihiv. 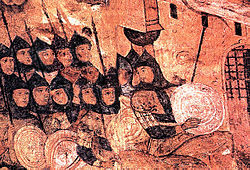 Three of Yaroslav's sons that first allied together found themselves fighting each other especially after their defeat to the Cuman forces in 1068 at the Battle of the Alta River. At the same time an uprising took place in Kiev, bringing to power Vseslav of Polotsk who supported the traditional Slavic paganism. The ruling Grand Prince Izyiaslav fled to Poland asking for support and in couple of years returned to establish the order. The affairs became even more complicated by the end of the 11th century driving the state into chaos and constant warfare. On the initiative of Vladimir II Monomakh in 1097 the first federal council of Kievan Rus took place near Chernihiv in the city of Liubech with the main intention to find an understanding among the fighting sides. However even though that did not really stopped the fighting, it certainly cooled things off. The last ruler to maintain united state was Mstislav the Great. After his death in 1132 the Kievan Rus' fell into recession and a rapid decline, and Mstislav's successor Yaropolk II of Kiev instead of focussing on the external threat of the Cumans was embroiled in conflicts with the growing power of the Novgorod Republic. In 1169, as the Kievan Rus' state was full of internal conflict, Andrei Bogolyubsky of Vladimir sacked the city of Kiev. The sack of the city fundamentally changed the perception of Kiev and was evidence of the fragmentation of the Kievan Rus'. By the end of the 12th century, the Kievan state became even further fragmented and had been divided into roughly twelve different principalities. The Crusades brought a shift in European trade routes that accelerated the decline of Kievan Rus'. In 1204 the forces of the Fourth Crusade sacked Constantinople, making the Dnieper trade route marginal. At the same time the Teutonic Knights (of the Northern Crusades) were conquering the Baltic region and threatening the Lands of Novgorod. Concurrently with it the Ruthenian Federation of Kievan Rus' started to disintegrate into smaller principalities as the Rurik dynasty grew. The local Orthodox Christianity of Kievan Rus', while struggling to establish itself in the predominantly pagan state and losing its main base in Constantinople was on the brink of extinction. Some of the main regional centers that later have developed were Novgorod, Chernigov, Galich, Kiev, Ryazan, Vladimir-upon-Klyazma, Vladimir of Volyn, Polotsk, and others. In the north, the Republic of Novgorod prospered because it controlled trade routes from the River Volga to the Baltic Sea. As Kievan Rus' declined, Novgorod became more independent. A local oligarchy ruled Novgorod; major government decisions were made by a town assembly, which also elected a prince as the city's military leader. In the 12th century, Novgorod acquired its own archbishop Ilya in 1169, a sign of increased importance and political independence, while about 30 years prior to that in 1136 in Novgorod was established a republican form of government - elective monarchy. Since then Novgorod enjoyed a wide degree of autonomy although being closely associated with the Kievan Rus. In the northeast, Slavs from the Kievan region colonized the territory that eventually became the Grand Duchy of Moscow by subjugating and merging with the Finnic tribes already occupying the area. The city of Rostov, the oldest centre of the northeast, was supplanted first by Suzdal and then by the city of Vladimir, which become the capital of Vladimir-Suzdal'. 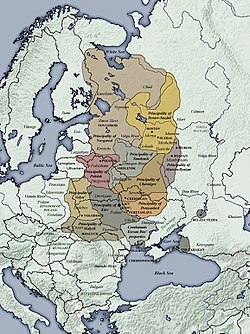 The combined principality of Vladimir-Suzdal asserted itself as a major power in Kievan Rus' in the late 12th century. In 1169 Prince Andrey Bogolyubskiy of Vladimir-Suzdal sacked the city of Kiev. Prince Andrey then installed his younger brother, who ruled briefly in Kiev while Andrey continued to rule his realm from Suzdal. Roman of Halych (1160–1205) also claimed primacy in Rus at the time. In 1299, in the wake of the Mongol invasion, the metropolitan moved from Kiev to the city of Vladimir and Vladimir-Suzdal. To the southwest, the principality of Halych had developed trade relations with its Polish, Hungarian and Lithuanian neighbours and emerged as the local successor to Kievan Rus'. In the early 13th century, Prince Roman Mstislavich united the two previously separate principalities, conquered Kiev, and assumed the title of Grand Duke of Kievan Rus'. His son, Prince Daniil (r. 1238–1264) was the first ruler of Kievan Rus' to accept a crown from the Roman papacy, apparently doing so without breaking with Constantinople. Early in the 14th century, the patriarch of the Eastern Orthodox Church in Constantinople granted the rulers of Galicia-Volhynia a metropolitan to compensate for the move of the Kievan metropolitan to Vladimir. Lithuanian rulers also requested and received a metropolitan for Novagrudok shortly afterwards. Early in the 15th century, these Metropolia were ruled again from Kiev by the "Metropolitan of Kiev, Galich and all Rus'". Kingdom of Galicia–Volhynia, one of the successor states of Kievan Rus'. The state finally disintegrated under the pressure of the Mongol invasion of Rus'. The state fragmented into successor principalities, tributary to the Golden Horde (the so-called Tatar Yoke). In the late 15th century Muscovite Grand Dukes began taking over former Kievan territories and claimed themselves to be the sole legal successors of the Kievan principality according to the logic of the medieval theory of translatio imperii. In the western periphery, the Kievan Rus' was succeeded by the Principality of Galicia-Volhynia. Later, as these lands along with the territories of modern central Ukraine and Belarus fell to the Gediminids, the powerful, largely Ruthenized Grand Duchy of Lithuania, drew heavily on Rus' cultural and legal traditions. Due to the fact that the economical and cultural core of Rus' was located on the territory of modern Ukraine some Ukrainian historians and scholars consider Kievan Rus' to be a founding Ukrainian state. On the northeastern periphery of Kievan Rus' traditions were adapted in the Vladimir-Suzdal Principality that gradually gravitated towards Moscow. In the very north, the Novgorod and Pskov Feudal Republics carried on a separate and less autocratic version of Rus' legacy into the 16th century until they were absorbed by the Grand Duchy of Moscow. During this Kievan period the Rus' experienced a period of great economic expansion. The people began to open trade routes with the Vikings to the north and west and the Byzantine Greeks to the south and west; traders also began to travel south and east eventually making contact with Persia and the peoples of Central Asia. Peasants lived in their own huts with their nuclear families and farmed their own plots of land using their own tools and livestock. Their households were grouped into rural villages and organized into communes (verve or miry), which had their roots in the tribal and clannic ties among the population. By the Kievan era, the communes had a territorial identity as much as a clannic one. Members of each commune shared common pasture lands, meadows and forests and fishing and hunting rights. They also shared responsibilities for tax payments and other legal obligations. The lands of Kievan Rus' which the peasants farmed were located primarily in two climatic zones, the forest belt and the forest steppe. The vegetation that grew naturally in these regions was forest. The spruce and fir that prevailed in the northern taiga gave way to cedar and birch then to oak further south. The forestlands were well watered: extensive river systems flowed through them and they normally received adequate precipitation to sustain agriculture. Their grey and dark grey soils however were not particularly rich. 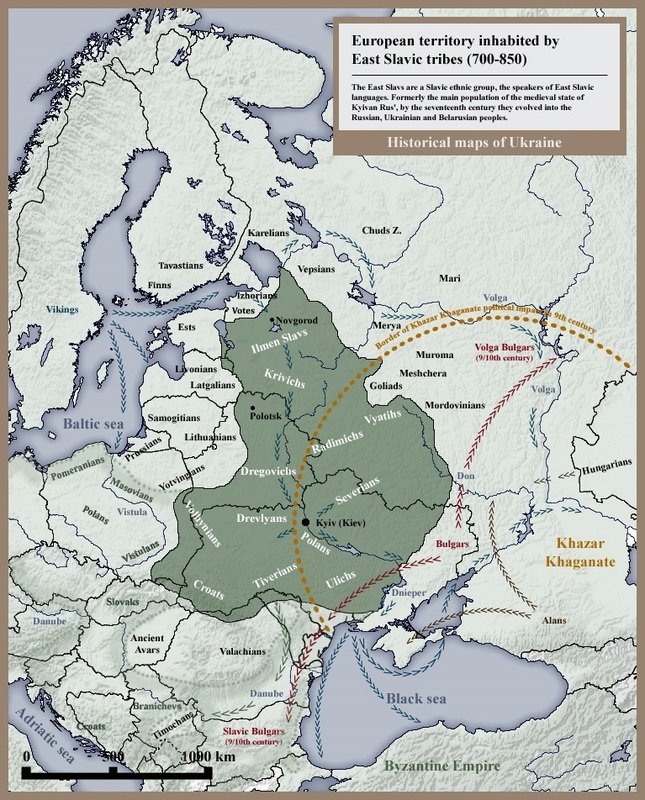 Fertile black soils were located only west and south of Kiev. Furthermore the lands of Kievan Rus' most of which were located north of the fiftieth parallel, and had short growing seasons. To accommodate these conditions the Slav peasants most commonly applied a method of farming known as slash and burn. To clear a section of forest for cultivation they cut deeply into the bark of the trees and left them to die and dry, then burned them. The resulting ash added to the soil sufficient nutrients to provide a fertile medium for several years. When the nutrients in the soil of one clearing were depleted, the peasants moved their corps to another, which they had prepared in the interim. The favored instrument of farming was Sokha. Pulled across the ground by a draft animal or a farmer, the Sokha's forked end, fitted with iron shoes, scratched furrows in the light ash-covered soil of the forest clearing. The farmers also used sickles for reaping, scythes for mowing hay and mattocks. In the forest clearing the farmers generally raised cereal grains: rye in the north, millet in the south supplemented by wheat, buckwheat, oats and barley. They also produced other crops such as peas and lentils, flax and hemp. The farmers also raised livestock. Horses, cattle, oxen, pigs, sheep, goats and poultry were the most common animals in the kingdom. The surrounding forests also supplied the rural population with berries, fruits, nuts and mushrooms. Also, farmers regularly fished in the river, lakes and steams, hunted for game and fur pelts and kept beehives for production of wax and honey. Due to the expansion of trade and its geographical proximity, Kiev became the most important trade center and chief among the communes; therefore the leader of Kiev gained political "control" over the surrounding areas. This princedom emerged from a coalition of traditional patriarchic family communes banded together in an effort to increase the applicable workforce and expand the productivity of the land. This union developed the first major cities in the Rus' and was the first notable form of self-government. As these communes became larger, the emphasis was taken off the family holdings and placed on the territory that surrounded. This shift in ideology became known as the verv'. The change in political structure led to the inevitable development of the peasant class or smerdy. The smerdy were free un-landed peoples that found work by laboring for wages on the manors which began to develop around 1031 as the verv' began to dominate socio-political structure. The smerdy were initially given equality in the Kievian law code, they were theoretically equal to the prince, so they enjoyed as much freedom as can be expected of manual laborers. However in the 13th century they began to slowly lose their rights and became less equal in the eyes of the law. Kievan Rus', although sparsely populated compared to Western Europe, was not only the largest contemporary European state in terms of area but also culturally advanced. Literacy in Kiev, Novgorod and other large cities was high. As birch bark documents attest, they exchanged love letters and prepared cheat sheets for schools. Novgorod had a sewage system and wood paving not often found in other cities at the time. The Russkaya Pravda confined punishments to fines and generally did not use capital punishment. Certain inalienable rights were accorded to women, such as property and inheritance rights. The economic development of Kievan Rus may be translated into demographic statistics. Around 1200, Kiev had a population of 50,000, Novgorod and Chernigov both had around 30,000. Constantinople had population of about 400,000 around 1180. The Soviet scholar Mikhail Tikhomirov calculated that Kievan Rus' on the eve of the Mongol invasion had around 300 urban centers. 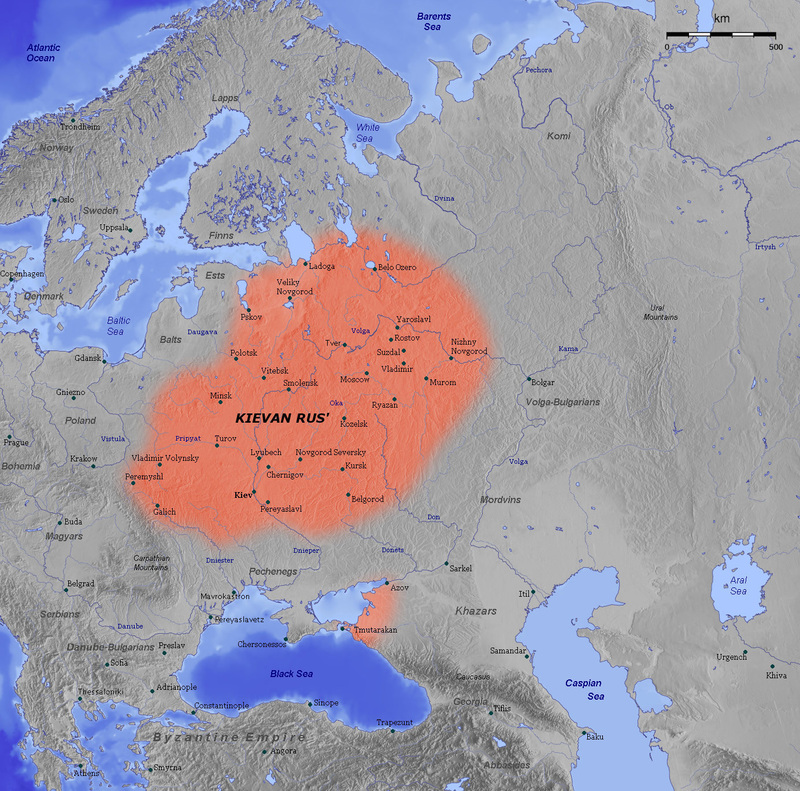 Kievan Rus' also played an important genealogical role in European politics. Yaroslav I the Wise, whose stepmother belonged to the greatest dynasty to rule Byzantium, married the only legitimate daughter of the king who Christianized Sweden. His daughters became queens of Hungary, France and Norway, his sons married the daughters of a Polish king and a Byzantine emperor (not to mention a niece of the Pope), while his granddaughters were a German Empress and (according to one theory) the queen of Scotland. A grandson married the only daughter of the last Anglo-Saxon king of England. Thus the Rurikids were the most well-connected royal family of the time. The Rurik Dynasty were the ruling the Kievan Rus' successor principalities of Galicia-Volhynia (after 1199), Chernigov, Vladimir-Suzdal, and the Grand Duchy of Moscow, as well as the early Tsardom of Russia (after 1168). From the 9th century, the Pecheneg nomads began an uneasy relationship with Kievan Rus. For more than two centuries they launched random raids into the lands of Rus, which sometimes escalated into full-scale wars (such as the 920 war on the Pechenegs by Igor of Kiev reported in the Primary Chronicle), but there were also temporary military alliances (e.g. the 943 Byzantine campaign by Igor). In 968, the Pechenegs attacked and then besieged the city of Kiev. There exist some speculations that the Pechenegs drove away the Tivertsi and the Ulichs to the regions of the upper Dniester river in Bukovina. The Byzantine Empire was known to support the Pechenegs in their military campaigns against the Eastern Slavic states. Boniak was a Cuman khan who led an invasions on Kievan Rus'. In 1096 Boniak attacked Kiev, plundered the Kiev Monastery of the Caves, and burned down the prince's palace in Berestovo. He was defeated in 1107 by Vladimir Monomakh, Oleg, Sviatopolk and other Rus princes. Kievan Rus' under the walls of Constantinople (860). The sacking of Suzdal by Batu Khan. In 988 the Christian Church in Rus' territorially fell under the jurisdiction of the Ecumenical Patriarchate of Constantinople after it was officially adopted as the state religion. According to several chronicles after that date the predominant cult of Slavic paganism was persecuted. It is uncertain the exact date of creation the Kiev Metropolitan as well as who was the first leader of the church. Predominantly it is considered that the first head was Michael I of Kiev, however some sources also claim Leontiy who is often placed after Michael or Anastas Chersonesos, became the first bishop of the Church of the Tithes. The first metropolitan to be confirmed by historical sources is Theopemp, who was appointed by Patriarch Alexius of Constantinople in 1038. Before 1015 there were five dioceses: Kiev, Chernihiv, Bilhorod, Volodymyr, Novgorod, and soon thereafter Yuriy-upon-Ros. The Kiev Metropolitan sent its own delegation to the Council of Bari in 1089. After the sacking of Kiev in 1169, part of the Kiev metropolitan started to move to Vladimir-upon-Klyazma, concluding the move sometime after 1240 when Kiev was taken by Batu Khan. Metropolitan Maxim was the first metropolitan who chose Vladimir-upon-Klyazma as his official residence in 1299. As a result, in 1303 Lev I of Galicia petitioned Patriarch Athanasius I of Constantinople for the creation of a new Halych metropolitan, however it only existed until 1347. The first Cathedral Temple was chosen the Church of the Tithes. In 1037 the cathedral was transferred to the newly built Saint Sophia Cathedral in Kiev. Upon the transferring of the metropolitan seat in 1299, the new cathedral was chosen the Dormition Cathedral, Vladimir. By the mid 13th century there were following dioceses of Kiev Metropolitan (988): Kiev (988), Pereyaslav, Chernihiv (991), Volodymyr-Volynsky (992), Turov (1005), Polotsk (1104), Novgorod (~990s), Smolensk (1137), Murom (1198), Peremyshl (1120), Halych (1134), Vladimir-upon-Klyazma (1215), Rostov (991), Bilhorod, Yuriy (1032), Chełm (1235), Tver (1271). There also were dioceses in Zakarpattia and Tmutarakan. In 1261 the Sarai-Batu diocese was established. ^ Kievan Rus, Encyclopædia Britannica Online. ^ a b Plokhy, Serhii (2006). The Origins of the Slavic Nations: Premodern Identities in Russia, Ukraine, and Belarus. New York: Cambridge University Press. pp. 10–15. ISBN 978-0-521-86403-9. http://assets.cambridge.org/97805218/64039/excerpt/9780521864039_excerpt.pdf. Retrieved 2010-04-27. "For all the salient differences between these three post-Soviet nations, they have much in common when it comes to their culture and history, which goes back to Kievan Rus', the medieval East Slavic state based in the capital of present-day Ukraine." ^ a b "Civilization in Eastern Europe Byzantium and Orthodox Europe". http://occawlonline.pearsoned.com/bookbind/pubbooks/stearns_awl/chapter15/objectives/deluxe-content.html. ^ (Russian) Назаренко А. В. Глава I // Древняя Русь на международных путях: Междисциплинарные очерки культурных, торговых, политических связей IX—XII вв. — М.: Языки русской культуры, 2001. — c. 42—45, 49—50. — ISBN 5-7859-0085-8. ^ "Российский и русский" (in Russian). Грамота.ру. http://www.gramota.ru/spravka/trudnosti/36_186. Retrieved 16 January 2012. ^ Tolochko, A. P. (1999). "Khimera "Kievskoy Rusi"" (in Russian). Rodina (8): 29–33. ^ The Russian Primary Chronicle, Encyclopædia Britannica Online; Russian Primary Chronicle, Selected Text, University of Toronto (retrieved June 4, 2013). ^ a b c Primary Chronicle, p.8. ^ Georgije Ostrogorski, History of the Byzantine State (2002), p.228; George Majeska, Rus' and the Byzantine Empire, A Companion to Russian History (Abbott Gleason, ed., 2009), p.51. ^ F. Donald Logan, The Vikings in History (2005), pp.172-73. ^ Primary Chronicle, p.8; Ostrogorski (2002), p.228; Majeska (2009), p.51. ^ a b c d Majeska (2009), p.52. ^ Angeliki Papageorgiou, ‘’Theme of Cherson (Klimata)’‘, Encyclopaedia of the Hellenic World (Foundation of the Hellenic World, 2008). ^ The Khazar khagan initially granted the Rus' safe passage in exchange for a share of the booty but attacked them on their return voyage, killing most of the raiders and seizing their haul. Vernadsky (1976), pp.32-33. ^ Saints Cyril and Methodius, Encyclopedia Brittanica. ^ If Olga was indeed born in 879, as the Primary Chronicle seems to imply, she would have been about 65 at the time of Svyatoslav's birth. There are clearly some problems with chronology. ^ Franklin, Simon (1992). "Greek in Kievan Rus'". Dumbarton Oaks Papers 46: 69–81. DOI:10.2307/1291640. ^ Colucci, Michele (1989). "The Image of Western Christianity in the Culture of Kievan Rus'". Harvard Ukrainian Studies 12/13: 576–586. ^ Janet Martin, [books.google.com/books?id=sRCc3TtL9bIC&lpg=PP1&dq=russian medieval history&pg=PA14#v=onepage&q=russian medieval history&f=false Medieval Russia, 980–1584] (Cambridge, 2003), pp. 14. ^ Pelenski, Jaroslaw (1987). "The Sack of Kiev of 1169: Its Significance for the Succession to Kievan Rus'". Harvard Ukrainian Studies 11: 303–316. ^ Kollmann, Nancy (1990). "Collateral Succession in Kievan Rus". Harvard Ukrainian Studies 14: 377–387. ^ Sherman, Charles Phineas (1917). "Russia". Roman Law in the Modern World. Boston: The Boston Book Company,. pp. 191. http://books.google.com/books?ie=UTF-8&vid=OCLC00824429&id=zh6ksO3bn0YC&pg=PA191&lpg=PA191&dq=advanced+culture+OR+cultural+Kiev+novgorod&vq=%22Russia+became+more+advanced++in+civilization+than+any+western+European+State+of+the+period%22. ""The adoption of Christianity by Vladimir... was followed by commerce with the Byzantine Empire. In its wake came Byzantine art and culture. And in the course of the next century what is now Southeastern Russia became more advanced in civilization than any western European State of the period, for Russia came in for a share of Byzantine culture, then vastly superior to the rudeness of Western nations."" ^ Vernadsky, George (1973). "Russian Civilization in the Kievan Period: Education". Kievan Russia. Yale University Press. pp. 426. ISBN 0-300-01647-6. http://books.google.com/books?ie=UTF-8&visbn=0300016476&id=1HEdAP9N6ikC&pg=PA277&lpg=PA277&dq=george+vernadsky&vq=education&sig=5qLzu9sfZQ2JdQ3jiM-nb3Ycm8Y. "It is to the credit of Vladimir and his advisors they built not only churches but schools as well. This compulsory baptism was followed by compulsory education... Schools were thus founded not only in Kiev but also in provincial cities. From the "Life of St. Feodosi" we know that a school existed in Kursk around the year of 1023. By the time of Yaroslav's reign (1019–54), education had struck roots and its benefits were apparent. Around 1030 Iaroslav founded a divinity school in Novgorod for three hundred children of both laymen and clergy to be instructed in "book-learning". As a general measure he made the parish priests to "teach the people."" ^ Miklashevsky, N.; and others (2000). "Istoriya vodoprovoda v Rossii" (in Russian). History of water-supply in Russia. Saint Petersburg, Russia: ?. pp. 240. ISBN [[Special:BookSources/5-8206-0114-0|5-8206-0114-0]]. http://ecoflash.narod.ru/likbez_8.htm. ^ (Russian) Tikhomirov, Mikhail Nikolaevich (1953) (in Russian). Пособие для изучения Русской Правды (2nd ed.). Moscow: Издание Московского университета. pp. 190. http://www.hist.msu.ru/ER/Etext/RP/. ^ Vernadsky, George (1973). "Social organization: Woman". Kievan Russia. Yale University Press. pp. 426. ISBN 0-300-01647-6. http://books.google.com/books?ie=UTF-8&visbn=0300016476&id=1HEdAP9N6ikC&pg=PA154&lpg=PA154&dq=george+vernadsky&vq=woman&sig=orLBptS63b4rGG_0QIUaFeCtp5o. ^ (Russian) Tikhomirov, Mikhail Nikolaevich (1956). "The origin of Russian cities" (in Russian). Drevnerusskie goroda (Cities of Ancient Rus). Moscow. pp. 36, 39, 43. http://www.archeologia.ru/Library/Book/3bcf6c93aa36/page9. ^ Lowe, Steven; Ryaboy, Dmitriy V.. The Pechenegs, History and Warfare. This page uses content from the English language Wikipedia. The original content was at Kievan Rus'. The list of authors can be seen in the page history. As with this Familypedia wiki, the content of Wikipedia is available under the Creative Commons License.